Stonework having irregularly shaped units and no indication of systematic coursework; also the horizontal distance covered by a flight of stairs. The horizontal distance from the face of a wall to the ridge of the roof. 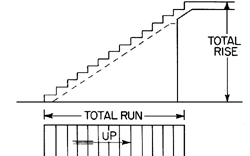 The width of a single tread in a stairway. The horizontal distance traversed by a flight of steps. The runway or track for a window. A single, complete execution of a computer program, or one continuous segment of computer processing, used to complete one or more tasks for a single customer or application. Also known as machine run. The amount of feedstock processed by a petroleum refinery unit during a given time; often used colloquially in relation to the type of stock being processed, as in crude run or naphtha run. A processing-cycle or batch-treatment operation. A portion of pipe or fitting lying in a straight line in the same direction of flow as the pipe to which it is connected. A ribbonlike, flat-lying, irregular orebody following the stratification of the host rock. A branching or fingerlike extension of the feeder of an igneous intrusion. The distance traveled by a craft during any given time interval, or since leaving a designated place. The underwater portion of that part of the aft end of a ship where it curves inward and upward to the stern. Steady, level flight of an aircraft across a target to enable bombs to be dropped accurately in horizontal bombing. Passing of a moving target once across the range. The occurrence of the same characteristic in a series of observations; can be used to test whether or not two random samples come from populations having the same frequency distribution. i. That part of a flight of a photographic reconnaissance aircraft during which photographs are taken. ii. That part of a flight of a combat aircraft during which bombs and other armaments are delivered. (1) To execute a program. The phrases "run the program" and "launch the program" are synonymous. (2) A single program or set of programs scheduled for execution. (3) In Windows, a command in the Start menu that lets you run a program directly. See Win Run command.